The 181-unit Garden Homes development in Simsbury, now under construction, will have 18 affordable apartments. The Senate gave final passage Wednesday to legislation that eases affordable housing requirements for municipalities. The bill, which the Senate approved 30-6, would make it easier for cities and towns to qualify for moratoriums under the 8-30g law that pushes – but does not require – all municipalities to have 10 percent of their housing stock deemed affordable. The bill’s advocates say relaxing the standards would give municipalities much-needed flexibility to develop affordable housing in a more realistic timeframe. 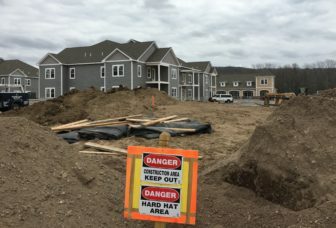 Detractors say it would only further ease pressure on towns to pursue new affordable developments, further slowing progress outside of the state’s urban centers, where many of the state’s new affordable units are being constructed. Despite bipartisan support in the Senate and a 116-33 vote in the House, the bill is not expected to receive a warm welcome from Gov. Dannel P. Malloy. Malloy denounced the bill earlier this week in an interview with the CT Mirror. “I don’t know what the hell people are thinking about” with this proposal, Malloy said while discussing the House’s passage of the bill. Under current law, towns below the 10-percent threshold can stop developers from skirting local zoning when affordable housing grows by 2 percentage points of their total housing stock. That qualifies them for a four-year moratorium on unrestricted development. The bill makes a number of changes to loosen those rules, though it includes a five-year sunset provision. All municipalities will be allowed to count more housing units as affordable, including some resident-owned mobile homes. Mobile home parks can be deemed affordable if they have certain percentages of units owned by residents with median incomes below the area’s. Based on the number of units and the income levels of their residents, towns can earn more points toward a threshold value to qualify for a moratorium. It also lowers a points threshold used to calculate when a community qualifies for a moratorium. “We want to encourage all types of affordable housing,” said Gayle Slossberg, D-Milford. Extend their moratorium period to five years for the second and subsequent moratoriums. Lower the threshold to qualify for another moratorium from 2 percentage points to 1.5 percentage points. “It is, albeit, still a very difficult number to reach, a very high and lofty goal,” Slossberg said. “But for example, instead of being required to build between 700 and 800 units those towns would now be required to build 500 units” to qualify for a moratorium. In the past 20 years, Slossberg said, none of the six municipalities has built that much affordable housing. While the bill drew bipartisan support, some of its backers remained skeptical of its aims. Sen. Gary Winfield, D-New Haven, who voted for the bill, said it is not something to be celebrated. 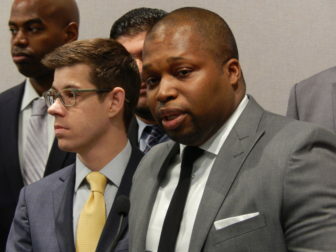 Sen. Douglas McCrory, D-Hartford, spoke at length in opposition to the bill, decrying the lack of initiative to tackle the state’s high housing costs.